This stone fort (canal milepost 112.5), with walls 17 feet high, was built in 1756 by Maryland Provisional Governor Horatio Sharpe. The fort was part of a chain of forts along the eastern Alleghenies during the French and Indian War, occupying a dominant position on North Mountain. Fort Frederick (named for Frederick Calvert, sixth Lord Baltimore) held prisoners in the Revolutionary War and a Union troop garrison in the Civil War. The fort was never seriously attacked. During the Civil War, there was a brief skirmish here on Christmas Day, 1861. 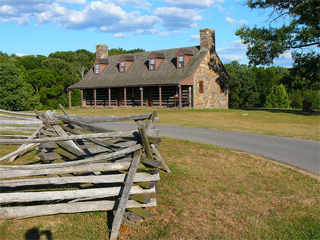 The fort was largely restored by the Civilian Conservation Corps as the last remaining British stone fort in North America. Fort Frederick, a state park, has picnicking, unimproved camping, boat ramps, trailer spaces, a souvenir shop, a museum, and boat rentals. The park has a beaver pond trail; and the C&O Canal passes nearby. Many events are held at Fort Frederick during the year. In April, the park sponsors the 18th Century Market Fair and Rifle Frolic. In May, the Maryland Forces and several other reactivated 18th-century military units present the annual Fort Frederick Rendezvous. Frontier skills and ranger tactics are stressed. In July, the annual Military Field Days involve setting up camps and demonstrations of frontier crafts. In September there is an annual Governor's Invitational Firelock Match. Featured are competitions with muskets, pistols, rifles, and tomahawks. Around Halloween, the park staff relates ghostly legends associated with the history of the park by having a "Ghost Walk." A calendar of events is published by the park.